One Can Never Have Enough Storage. The stairs take a sharp left on that landing. There was an opening where the door is now and that square on the right side wall. Closet floor and wall up over bottom flight. More room! Closet bones complete! Magnetic door works like a charm. Everything in and ready for stuffing. Shopped my heart out and getting things put in their rightful spots. I like this story of Michele de la Vega much due to her visual determination in designing and moving on through her downturns as well as her creative endeavors and skill. 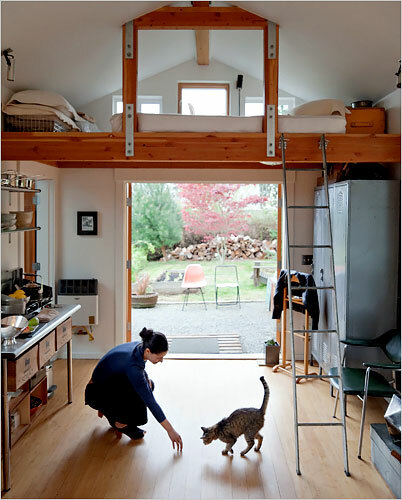 Her 250-square foot house was a garage before it became her permanent dwelling. Loosing the family home in her high school years and then a marriage later on, Michele took her monies from a divorce settlement and moved onwards and upwards through downturns. She survived by buying a home in Seattle, renting out the main house for income and moving in to the original garage. After nine-months of renovation work on this small structure, attending welding school to learn how to build furniture, and salvaging fixtures from local scrap yards, Michele took up permanent residence in the tiny and minimalist garage. Now remarried and living in the larger house, she shares her happy endings with the New York Times. Right on Michele! Keep up the good work and congratulations on new beginnings!! Michele de la Vega outside her small garage home. 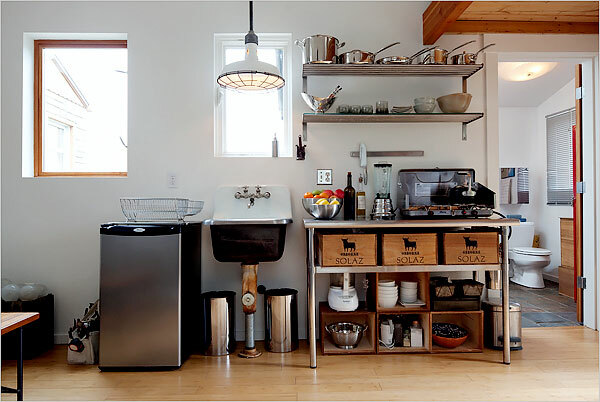 The house is furnished with pieces she found in industrial salvage yards, including old lockers from a United Airlines maintenance building. Shadow-boxes hold paper pillows emblazoned with architectural drawings made by her late father. Industrial latches function as towel hooks. 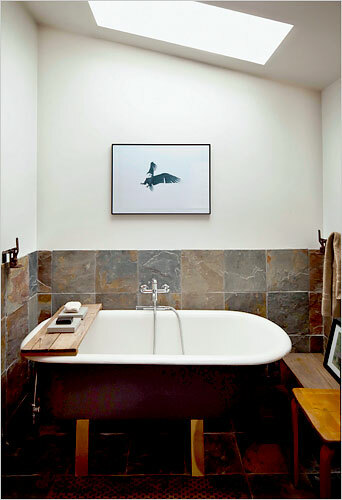 The industrial sink, ceiling lamp and wooden wine crates are all salvaged items. 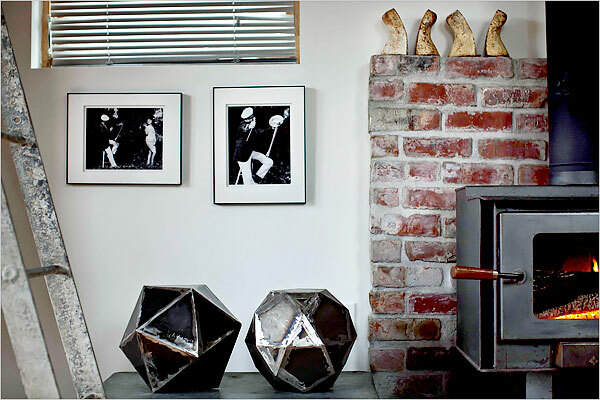 A pair of artful metallic objects that Michele welded in an industrial tent in her driveway are on display as sculpture. 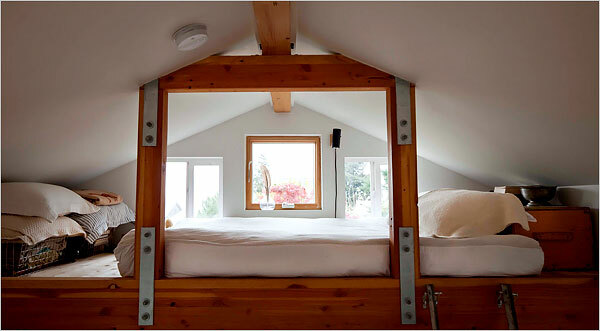 A reclaimed ship's ladder leads up to her sleeping loft. 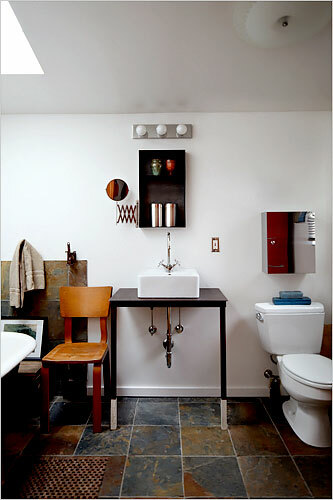 Michelle independently designed and welded the red metal locker and recessed metal shelf above the sink. 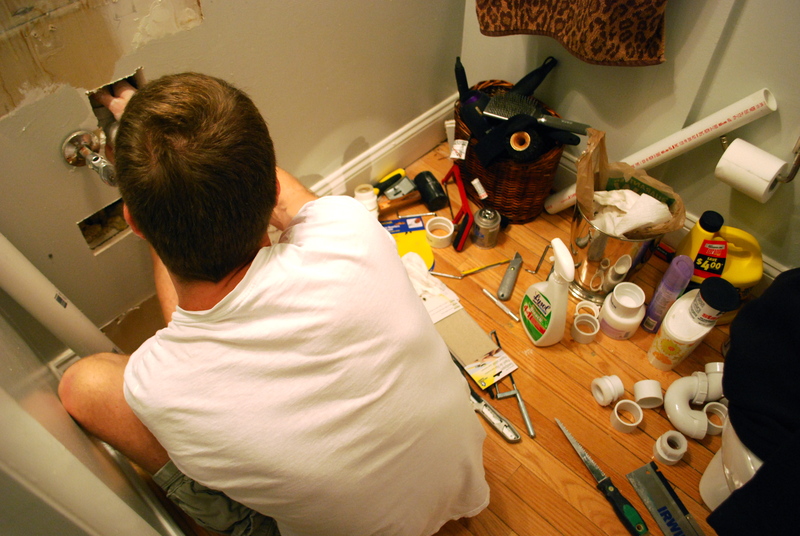 Last weekend was a two-day DIY project with the “master” bathroom in my condo. I love my Roost Horn Mirror and Restoration Hardware double wall light fisture. At this point, all I needed was some extra storage to stash lotions and potions. My lovely handyman Greg and I checked out Home Depot, Lowe’s, and several online distributors and vendors. With a small corner space and limited movability of the wall pipes, we new we had to find a sink with a drain that was around 10 inches from the wall. The budget has to also be realistic at around $300. 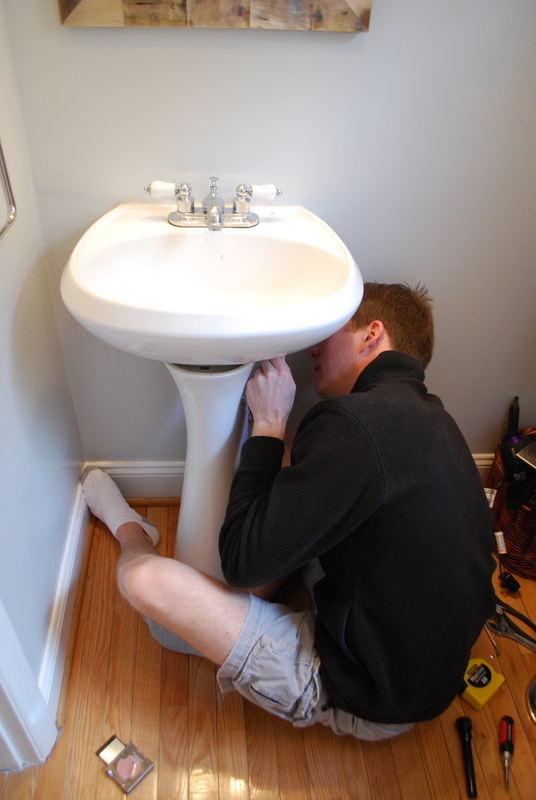 Before: Original pedestal sink ready to get ripped out. After one trip to Lowes, a $285 Allen & Roth bow front wood cabinet with white ceramic sink top set was in the back of my Toyota Highlander. 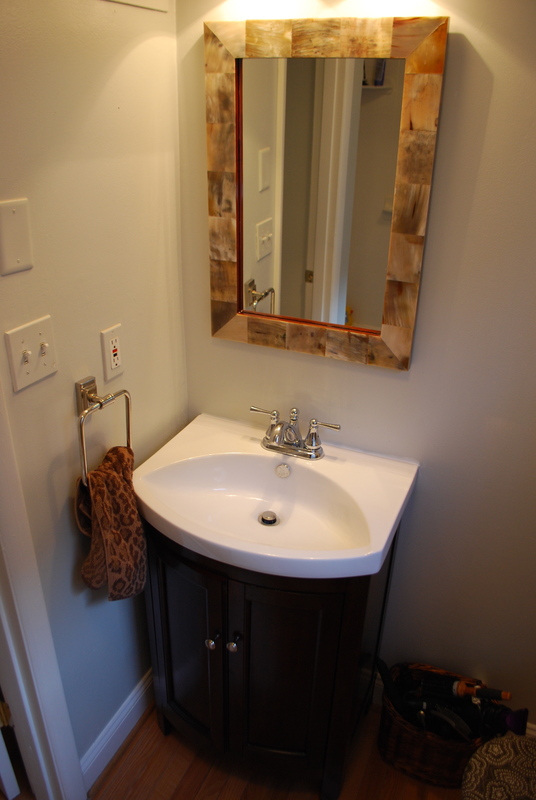 Out came the worn and white builder grade (circa 1999) pedestal sink and in went the perfect new cabinet and top. 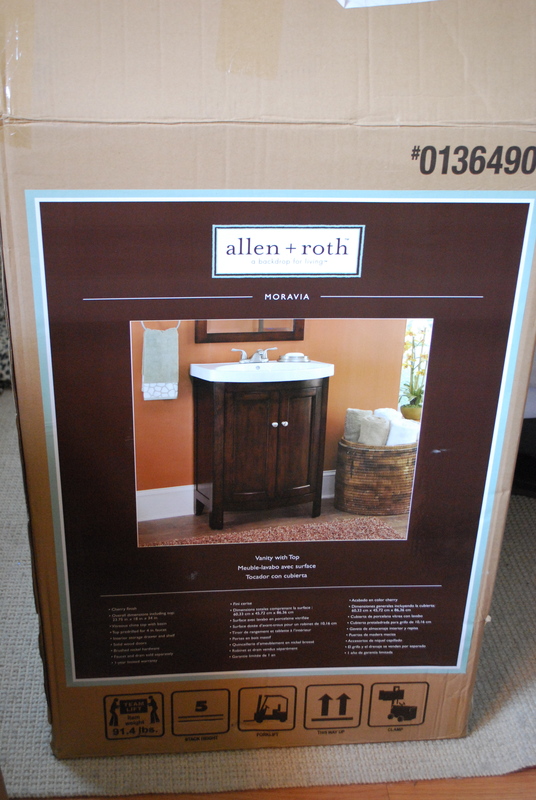 New wood and ceramic Allen & Roth vanity. Once we opened up the wall, we found that some pipes had to be removed and others had to be cut to be able to line up the sink drain pipe with the U-shaped pipe running from the wall (I can’t believe I just forgot what that pipe is called!! It’ll come to me…). My handyman taking out the old stuff. My handyman making everything work (and not leak). It deserved a quick trip for more materials from the local Home Depot but after a 7 hour project from out with old to in with the new, we were finally ready to run some water. 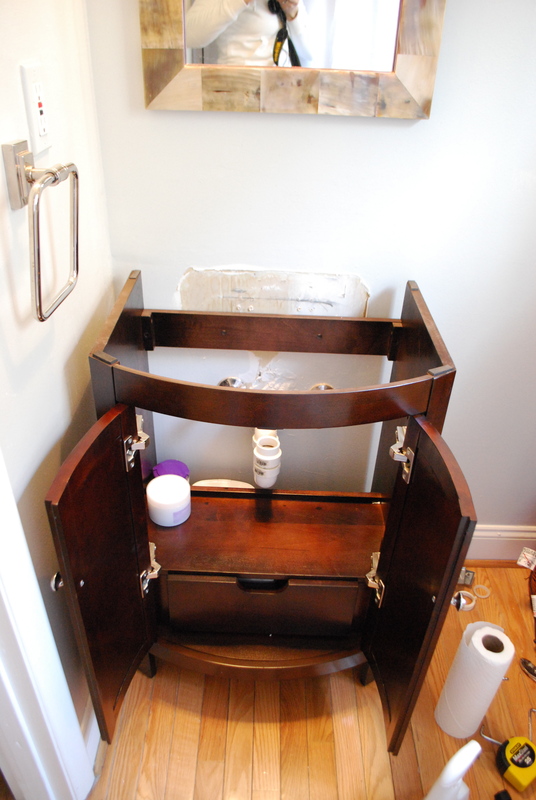 Wood vanity in place waiting for the new sink! After: Love love love the results! My horn mirror looks fantastic with! Hand towel fixture has to be moved! Update: Project Kitchen Has Shiny Stone! We’re nearing completion. Since my last post on Project Kitchen, the granite countertop has been installed and we’ve begun pulling ideas for a backsplash! Next step is to find the right backsplash – whether it’s mirrored, covered in creamy glass subway tiles, or even left painted and treated with a nice calm coordinating pattern. The new granite is Brazilian Marron Cohiba – a rich blend of deep browns, blacks and peices of mica mineral! New counter top works great with the appliances! For the new facet and sink, we decided on an under counter mount deep set rectangle sink that can hold all of the signs of a good dinner party without being seen by guests. 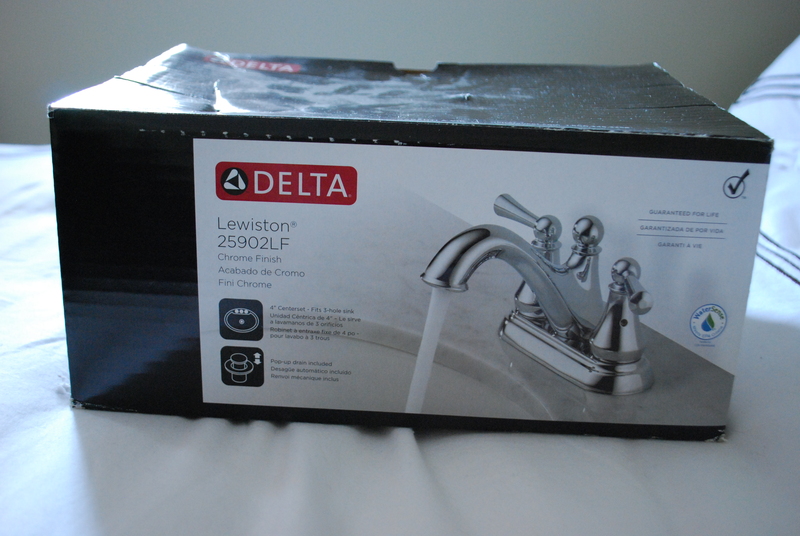 =) The Como faucet is by Danze and has a sprayer built into the nozzle. Its very modern with out being to severe. 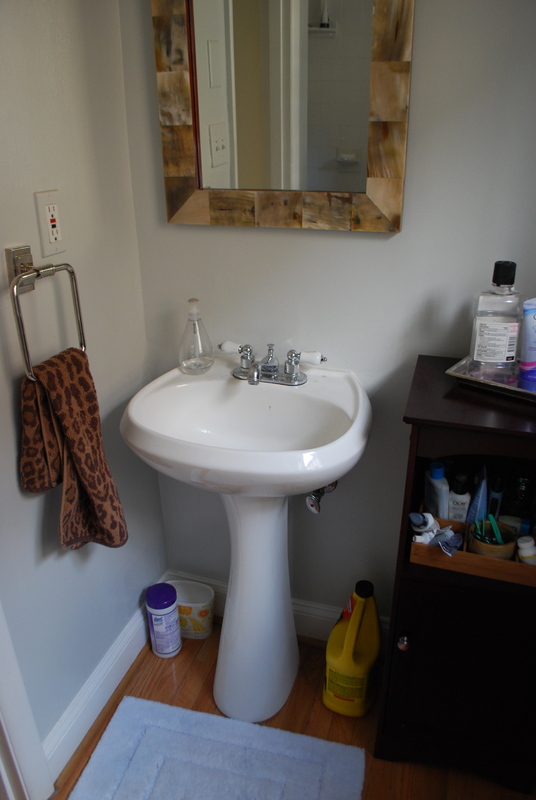 I love the one handle operation and the handy coordinating Danze Parma soap pump! Brushed stainless steel single lever faucet and soap dispenser. The island is now open into the dining room! We got six more inches of space with the tear down! I’ve got, yet again, a fav article from Interior Design Magazine. 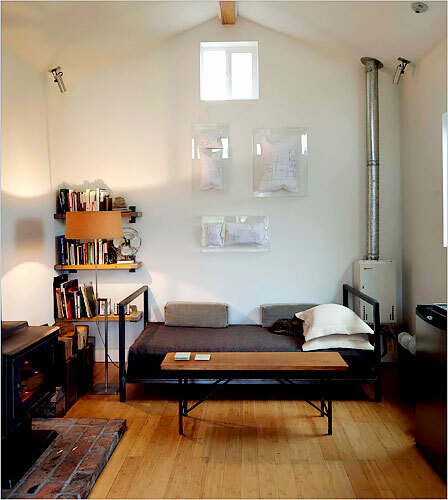 The final results for a renovated loft in a neighborhood of converted warehouses are fantastic! The space should not always be the dictator in the way you live. Breaking down barriers in design can bring on amazing and efficient ideas. =) Enjoy the article! Late Summer Update: Project Kitchen. It’s nearing the end of a beautiful Washington DC summer (minus all of the typical humidity) as well as the end of this kitchen renovation that has absorbed a couple of weekends of free time. But I love the work, so its been a fun journey for me personally and professionally. New appliances, re-painted hardwood cabinets, and new brushed nickel hardware (plus a wall hung vintage bottle opener) is all complete and installed. It is such an amazing improvement. Yeah! New Kitchen Aid Appliances from Sears. Just this past weekend, we ripped out that grey laminate countertop and cut down a low wall (messy and loud job sawing through metals studs) to allow for three side of the new countertop to show. Check out the progress! Countertop ripped out and wall about to be cut down. Level countertop ready for Marron Cohiba Granite! Countertop now an island - looking from dining area. The new granite countertop gets installed today (by awesome Dominion Granite and Marble!) and I’ll have those pretty pictures for you later this week.